Looking forward to buy a car? Or want to feel the air kissing on a super-amazing bike? Reach out to droom.in. India’s most trusted motorplace, Droom is one of the top ecommerce platforms offering wide collection of new and used automobiles. With broad 15 categories of automobile and automobile services, Droom has something for everyone. Motorcycles/Bikes – This is the most popular category at Droom with broad selection of Used Motorcycles from commuter to sports bike to café racer. 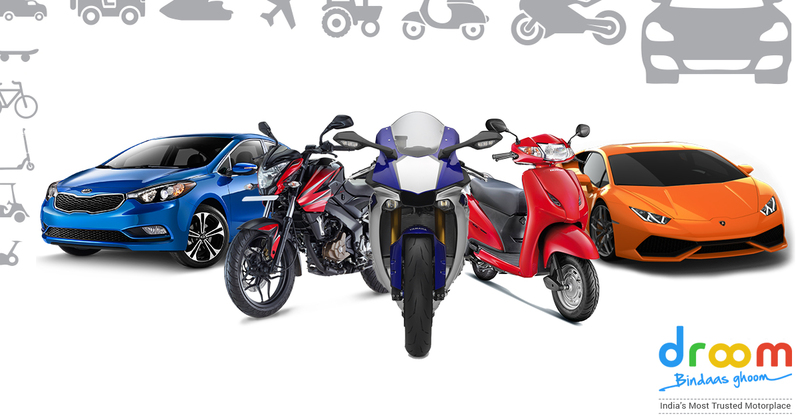 Find all popular Makes here like Bajaj, Honda, KTM, TVS, Suzuki, Harley Davidson, and many more, at extremely affordable prices. Scooter – It offers great comfort in traversing within the city. If scooter is your next buy, then consider Droom. You can find great Used Scooters deals on Makes including Honda, LML, Hero, Kinetic, Yamaha, Mahindra and more. Cars – When it’s about family get away, nothing is better than a car. Droom offers extensive range of cars from trusted sellers to avoid major pitfalls. Get hatchback, SUV, sedan, and anyone on your list. Also you will find great Used Cars falling in every budget and choice. Super bikes – Nothing can beat the speed of a superfast mean machine. If you love speed, excitement, and freedom, then Droom is your place to find widest selection superbikes at prices you need not think twice. Super cars – Get the ultimate luxury with Droom super cars brining what you deserve. Flaunt your absolute style statement while you go from home to office to anywhere in a high end super car, sure to make heads turn. Get popular super cars from big players like Lamborghini, Porsche, Audi, Land Rover, Ferrari, Rolls Royce and more. Nothing but the best is what you get at when you shop any used vehicle at Droom. On top of great price and wide selection, you get verified vehicle, verified seller, security for money, trust and ease to shop from anywhere anytime. What’s stopping you? Find your dream bike or car at Droom and get ready to hit the road.